^ 1.00 1.01 1.02 1.03 1.04 1.05 1.06 1.07 1.08 1.09 1.10 1.11 1.12 1.13 1.14 1.15 1.16 Population and dwelling counts, for Canada, provinces and territories, and census subdivisions (municipalities), 2016 and 2011 censuses – 100% data (Yukon). Statistics Canada. 2017-02-08 [2017-02-11]. ^ 2.0 2.1 Population and dwelling counts, for Canada, provinces and territories, 2016 and 2011 censuses – 100% data. Statistics Canada. 2017-02-06 [2017-02-11]. ^ Interim List of Changes to Municipal Boundaries, Status, and Names: From January 2, 2012 to January 1, 2013 (PDF) (PDF). Statistics Canada: 6–7. [2014-08-19]. 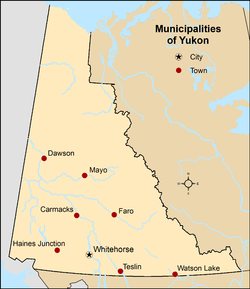 ^ 4.0 4.1 Yukon Communities. Yukon Government: Department of Community Services. 2013-11-07 [2014-01-15]. （原始内容存档于2014-01-16）. ^ 5.0 5.1 5.2 5.3 5.4 5.5 5.6 5.7 5.8 5.9 Municipal Act (PDF) (PDF). Government of Yukon. 2002 [2014-01-06]. ^ Association of Yukon Communities Incorporation Dates. Association of Yukon Communities. [2014-07-14]. （原始内容存档于2014-07-14）.